Hello and welcome to my Dorset photographer page. On this page of my site you can view a selection of my pictures of Dorset. I am fortunate enough to live in the lovely county of Dorset, and enjoy photographing not only the iconic Dorset landmarks but also the lesser known but equally picturesque parts of Dorset I have discovered over the years. I have other pages on my website which are dedicated to the photographs I have taken in specific locations in Dorset, namely Bournemouth, Poole and Sandbanks. This page is just a set of 12 pictures taken in Dorset. The images you can view on this page of Dorset photographs are mainly landscape photography images, which are used in my commercial stock photography work, as well as in publications for clients. I have also carried out numerous architectural photography commissions in Dorset, including some very special local Dorset buildings. I have restricted the number of images on my Dorset page to 12, which was a struggle to be honest. I wanted to include a variety of commercial, architectural, interior, landscape and building construction photography images. But then I had a rethink. People searching on the internet for pictures of Dorset are probably after nice landscape images, not the façade of some brand-new building. I do update the content of my web pages regularly, so the photography you can see now will change, normally once or twice a year. This set of photos of Dorset was added to this web page in February 2017, so if you are reading this in January 2018 I clearly have not updated the page! I was also going to include a couple of black and white landscape photography images, but these now have their own page which is called, very imaginatively, Black and white landscape photography in Dorset. 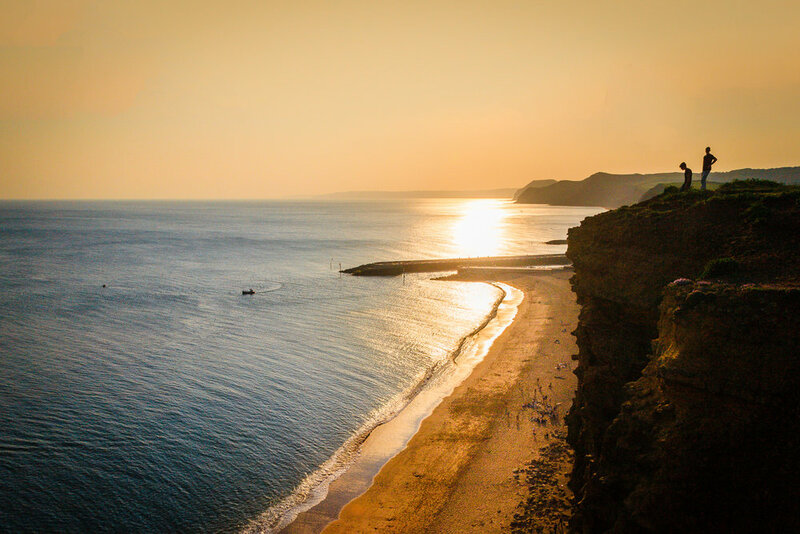 One other thing I need to mention before I forget is that if you head on over to my photography blog you will find a daily post, quite often including a new picture taken in Dorset. Why do I have a web page just for Dorset? The purpose of my Dorset photography page is to share a selection of professional photography pictures of Dorset which people might not have seen before – I doubt you will see a similar selection of Dorset photos on one web page! And that is one of the benefits of being a freelance photographer – I can pretty much put what I want on my website! Well not quite but you know what I mean. I did not want to just include 12 pictures of iconic Dorset landmarks – you can see these in so many places, so I have added some lesser known locations which I will describe below. The set of images on this page were assembled in December 2016, and include old and new images taken in Dorset. And yes, if you are concentrating you will know that earlier on I said that this web page was updated to what you are reading in January 2017. And to be honest it was February 2017. That is how long it took me to select 12 Dorset photos for this page of my website. How I went on picking my 12 Dorset images. Firstly, why 12? Well why not? It could be 9. Now hold on a minute, nine images in a grid 3*3. I had enough trouble getting down to 12! So, a bit about each of the images is in order I think. The text below is describing the images in no particular order now, as I change the order they appear in the gallery to keep things fresh. The first image (in date order that is) was taken on the beach at Kimmeridge Bay just after sunrise. This is one of favourite views of Kimmeridge. Problem is I couldn’t choose between the two shortlisted images. I will either post the image with the waves crashing up in front of the camera, or the one with the rock in the foreground with the water flowing over it. It will be one or the other, or both if I change my mind. Either way it will be a picture from this famous stretch of Dorset coastline. Another sunny landscape image is the picture from the top of the cliffs overlooking the entrance to Bridport Harbour and West Bay. This is a lovely warm early summer view of the cliffs, sea and beach. As I often say – everyone loves a lighthouse – is next. This is the square on view from the side for a change, with lovely clean bright summer light and some interest in the sky. Obviously architectural photography is my equal favourite with landscape photography. 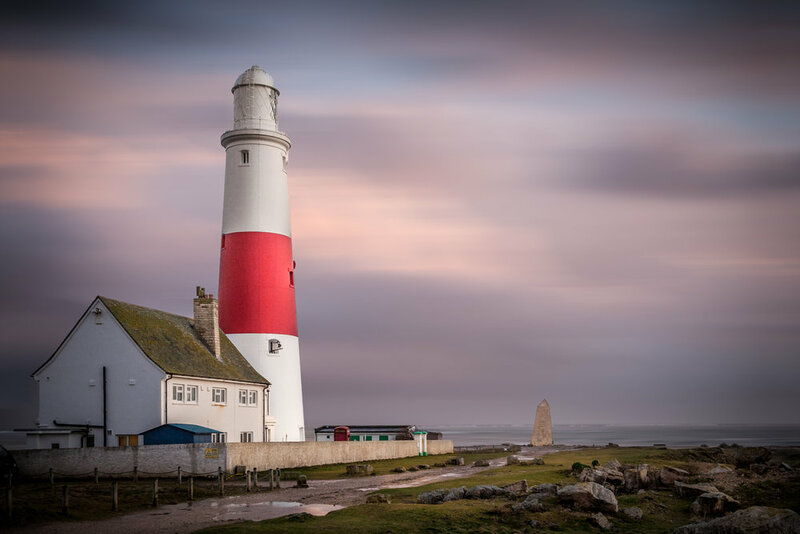 Portland Bill Lighthouse is owned and operated by Trinity House. A new image that I have never published listed before. Well an old image but new to the world. I know what I mean. I might go and re-shoot this post, but this will do for now. 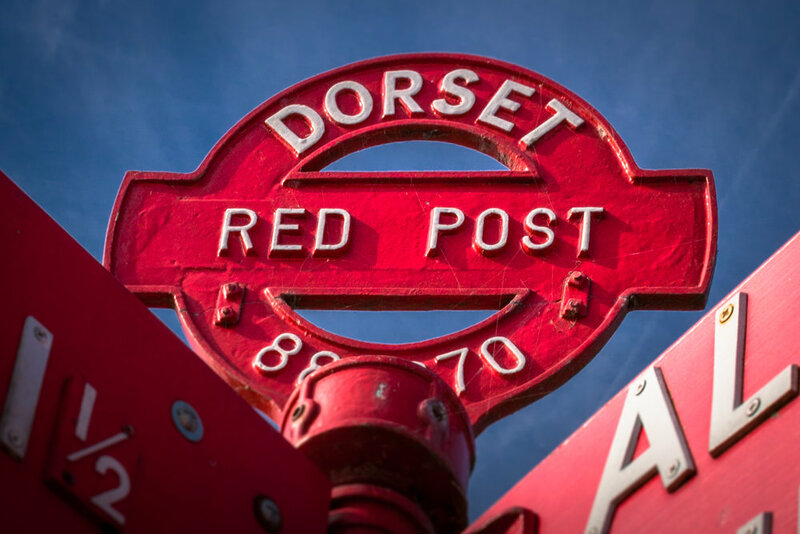 I have always liked my pictures of the Dorset Red Post, but chose this image which I have never edited before. I had completely forgotten that the other images I have posted were the wider shots when the thing of most significance on this shot is the small central plaque with the words, “Dorset Red Post” no less. And the red post of course. Next is the shop at Lulworth Cove called Cove Fish. I wanted a picture of Lulworth Cove, but not necessarily actual Lulworth Cove itself. Most people pass this building on their way down to Lulworth Cove. Well this is what I have seen, but hopefully enough people go into the shop and buy some of the lovely fresh fish on sale. I like the mood and the feel of this picture. I know – how did a property photography image work its way into my Dorset gallery?? Bats Head, photographed from near Durdle Door looking west towards Weymouth. This is dramatic, bright, vibrant morning sunshine illuminating the spectacular Jurassic Coast. Another picture I really like, and one for the Dorset Photographer page of my website. 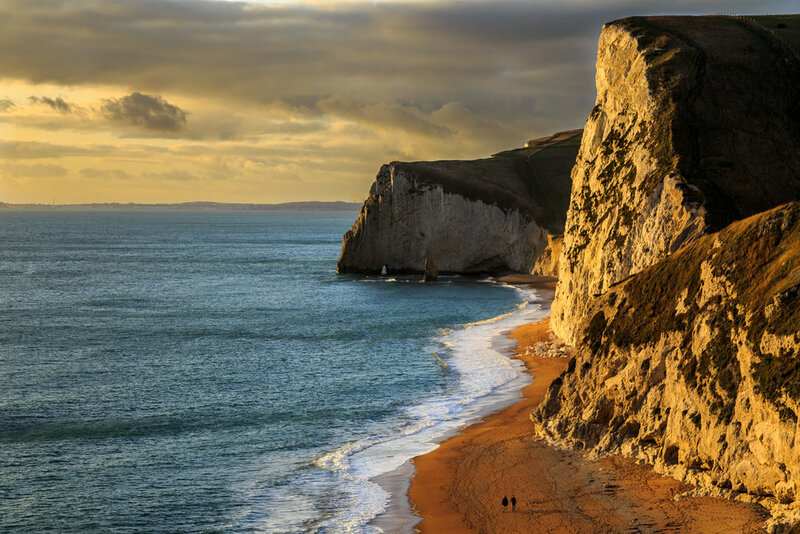 This picture of the Jurassic Coast is made by that dramatic morning light. Bats Head is a great subject to photograph. Ringstead Bay is a lovely National Trust site, from which you get great views of Portland. I was very lucky to be there and capture the amazing light in this image using a telephoto lens to isolate the land and the late winter sun and all those lovely colours and textures. It is not easy to a picture of Lulworth Cove. It is quite big, and I had to get a good way back up the steep sides to photograph the cove, even with my 17mm lens. I was very fortunate that the sun decided to make a late appearance from under the clouds to give that splash of warmth to the scene. 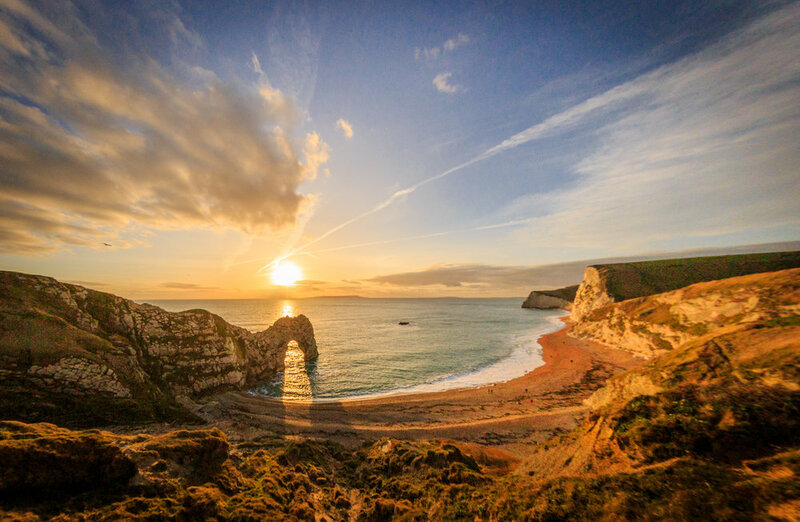 A stunning picture of the Jurassic Coast, with the cliff face illuminated by the late winter sun. Two people walking on the beach give the image scale and perspective. To get this view you have to just keep walking on beyond Durdle Door, up and down a few hills. It is well worth it trust me. So, good I included Durdle Door twice. There are two views of Durdle Door, the first being a classic view looking back to Durdle Door having walked along the path to the west. The second picture (or first depending on how I sequence them) is the view of Durdle Door from the other side of the path on the Jurassic Coast. I wanted to capture the whole scene, including the beach and cliffs beyond, spectacular features of the Jurassic Coast. Obviously, I waited for the sun to line through with the famous rock arch. Brownsea Island is a very popular Dorset attraction. This National Trust site is accessible by boat from Poole Quay and a couple of other places in Poole Harbour including right next to where you drive on to the chain ferry. This sunset picture was taken on Shore Road in Sandbanks, one of my favourite roads. Something completely different is this picture of the misty woods in Poole. I want my collection of pictures of Dorset to be a bit different, and love the mood and feel of this picture taken on one of those winter days when it was sunny then misty all day long. 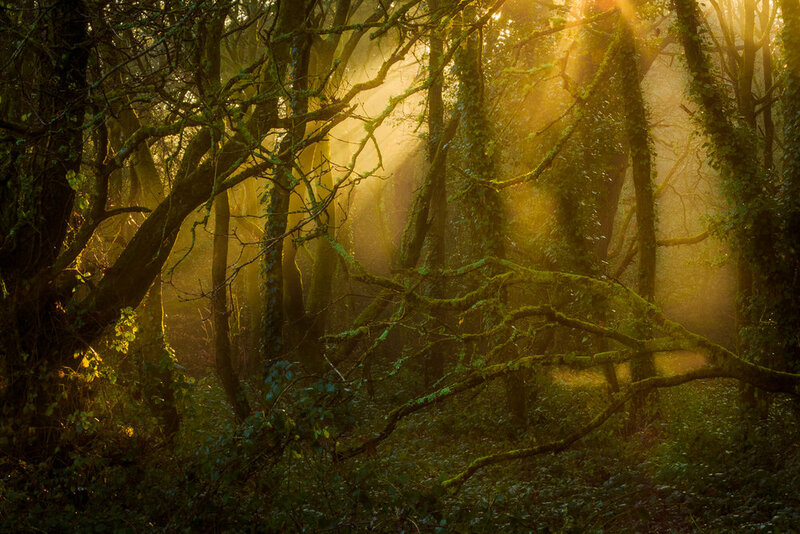 The rays of sun are illuminating the patches of mist in the lovely woods near Broadstone. How you can buy my pictures of Dorset? If there is a picture of Dorset you would like to purchase please get in touch with and I can provide a quotation. And of course, if you have a photography assignment you would like to employ a professional photographer to carry out for you again get in touch and I can discuss pricing either on a half day rate, full day rate, a fixed price or a price per image. Please speak to me first about what you are looking for and how I may help you. I guarantee you will be able to find a cheaper photographer than me in Dorset, but price is not why people hire me – it is for my skills as a professional photographer, my experience and my high quality, professional service. Please don’t forget, I am an independent, freelance, professionally qualified photographer based in and working in Dorset. Ok I am beginning to sound like a salesman so I will stop. Thank you for reading this far down the page, and I hope you enjoy my pictures of Dorset. If there is anything I can help you with just get in touch with me – I respond to everyone who takes the time and trouble to contact me.